Hyperthyroidism refers to any condition in which there is too much thyroid hormone in the body. It is sometimes referred to as overactive thyroid. More than 90% of affected individuals will go back to normal thyroid function without treatment. Characteristic symptoms and physical signs can suggest that hyperthyroidism may be present; however, laboratory evaluation is necessary to establish the diagnosis and cause of hyperthyroidism. With mild hyperthyroidism, the free T4 will remain in the normal range. T3 is often elevated to a relatively higher level than T4 in severe hyperthyroidism. TRAb binds to the TSH receptor and blocks TSH from binding, resulting in reduced THS receptor function and reduced thyroid hormone production. If lab tests indicate hyperthyroidism, imaging tests may be used to further determine the cause. Radioactive iodine thyroid scan-with either I-231 or 99mTc. In this test if the patient's thyroid is scanned, they will swallow radioactive iodine or have an injection of 99mTc. The patient will then wait for the isotope to be taken up by the thyroid gland, and images will be taken to show the amount of isotope taken up by the thyroid. "Cold nodules" (swellings in the thyroid gland that do not take up the radioactive isotope on the thyroid scan) may require additional evaluation by fine needle aspiration biopsy to exclude a tumor. Increased serum T4 levels without hyperthyroidism, usually from an inherited condition. The treatments discussed here are for all causes of hyperthyroidism except for subacute thyroiditis. Subacute thyroiditis typically gets better without any specific treatment. The treatment options for hyperthyroidism caused by Graves' disease or nodular thyroid disease are divided into two sections. symptomatic treatment to alleviate the effects of excess thyroid hormone. Although the most common treatment of overactive thyroid disease is radioactive iodine ablation, many patients are initially treated with antithyroid medication to normalize thyroid hormone levels prior to either radioactive iodine ablation or thyroidectomy. Surgery is used to treat hyperthyroidism if the patient requires a quick reduction in thyroid hormone levels such as during pregnancy. Increased risk of liver failure. FDA black box warnings restricts use of PTU to those patients who cannot tolerate methimazole or are in the first trimester of pregnancy. Effect: damages the thyroid cells that make thyroid hormone. This is the most common permanent treatment of hyperthyroidism in the United States. During pregnancy, radioactive iodine may destroy fetal thyroid tissue. Breastfeeding women may pass radioactive iodine through breast milk. A six month waiting period before pregnancy is suggested after therapy. Removal of part of thyroid gland containing overactive nodule. The entire thyroid may be removed if there are multiple, bilateral overactive nodules or if the goiter is enlarged. Removal of entire thyroid gland. Most patients will remain euthyroid (having normal thyroid function) after thyroid lobectomy. There is a small risk of recurrent hyperthyroidism if a large amount of remaining thyroid gland is left after the surgery. There is a small risk of damage to structures near the thyroid, including the nerve to the voice box, and the glands that regulate calcium levels in the blood. Amiodarone is a drug used in the treatment of abnormal heart rhythms. Amiodarone tablets (Cordarone, Pacerone) contain iodine, and up to 10% of people taking this medication develop abnormalities in thyroid function. 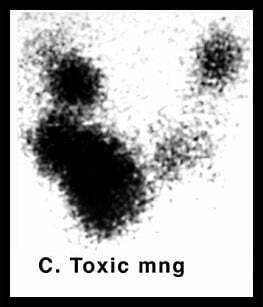 Excess iodine in the contrast material used for CT scans may cause an increased production of thyroid hormone. Complications may also arise from side effects of therapies, including radioactive iodine, surgery, and thyroid hormone replacement therapy. Figure 1 Above: Radioactive iodine scan of a patient with toxic multinodular goiter. Note the patchy and darker appearance of the nodules that are producing excess amounts of thyroid hormone. Compare this to the normal scan shown in Figure 3. 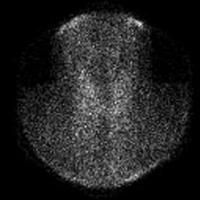 Figure 2 Above: Radioactive iodine scan of a patient with subacute thyroiditis during the hyperthyroid phase. Note that there is very little iodine uptake in the thyroid. 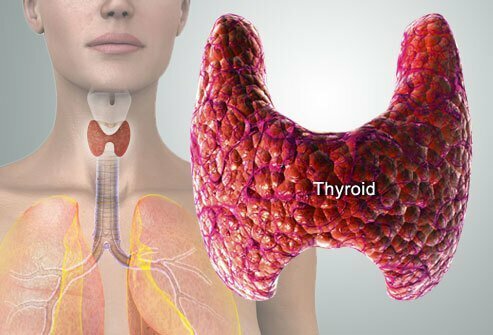 This is due to inflammation of the thyroid causing release of stored thyroid hormone (causing elevated thyroid hormone levels in the blood) and reduced iodine uptake. Figure 3 Above: Radioactive iodine thyroid scan. 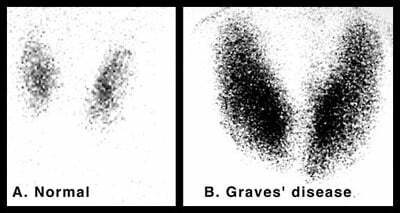 Comparison between scans from the normal patient and a patient with Graves' disease. Note the overall increased uptake throughout the enlarged thyroid gland in a patient with Graves' disease. Thyroidectomy: The surgical removal of part or all of the thyroid gland. Treat hyperthyroidism (excess production of thyroid hormone). The goal in the case of hyperthyroidism is to leave just enough thyroid tissue to make a normal amount of thyroid hormone. If too much thyroid is removed, the patient will produce too little thyroid hormone (hypothyroidism) and need treatment to return the thyroid status to normal (euthyroid) status. The possible complications of thyroid surgery include vocal cord paralysis and accidental removal of the parathyroid glands (located behind the thyroid gland), resulting in low calcium levels (the parathyroid glands regulate calcium). Subtotal thyroidectomy is appropriate in some people with hyperthyroidism, especially those with a large goiter, and it may also be indicated in cases with a coexistent thyroid nodule whose nature is unclear. The patient is treated with an antithyroid drug until euthyroidism has been achieved and inorganic iodide is also usually administered for seven days before surgery to "cool down" the overactive thyroid gland. In surgical centers with the most experience, hyperthyroidism is cured in more than 98% of cases with low rates of complications. Surgery is more costly than nonsurgical therapy of hyperthyroidism (with an antithyroid drug or radioactive iodine). MedscapeReference.com. Hyperthyroidism, Thyroid Storm, and Graves Disease. For hyperthyroidism, what were the symptoms and signs you experienced? What Symptoms did you experience with hyperthyroidism?